WINE TASTING. Two strong recommendations, lots of education. On November 19, we attended a wine tasting hosted by Cuvée, Ocala’s wine bar and bistro (HIGHLY RECOMMENDED). The wines were presented by Tom Tiley, wine consultant with Coastal Wine & Spirits. Tom’s background includes 15 years as a Level Two Sommelier and work in French and California wineries. It’s a lot of fun to be entertained and educated by someone as passionate and knowledgeable as Tom. The tasting was arranged by David Lewis, Cuvée’s General Manager, a man who is equally passionate about wine and great food. With Cuvée being our first strong recommendation in this post, we came away with one HIGHLY RECOMMENDED wine selection (first up, below). The other five wines were significantly more expensive than our $20 Frugal Wine Snob price limit. However, we learned so much from the tasting that we are passing along our notes to you in case the information is helpful. Enjoy! WINE ONE: HIGHLY RECOMMENDED. 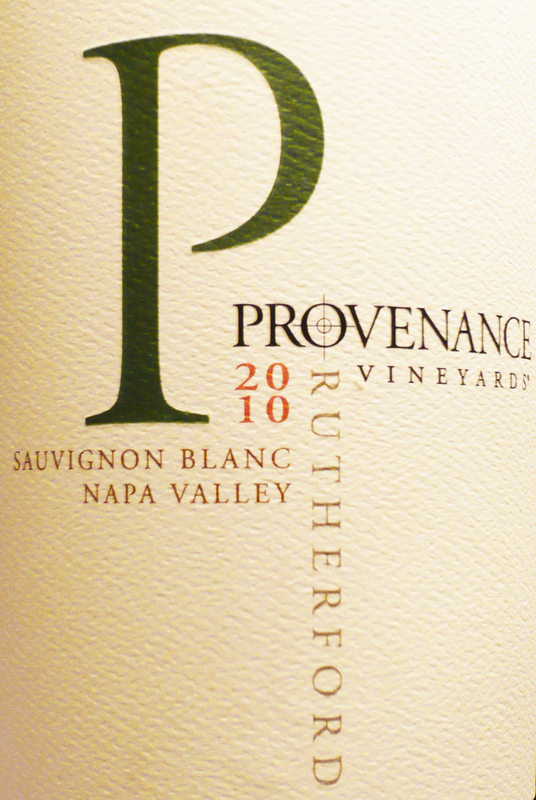 Provenance Vineyards, 2010 Sauvignon Blanc, from the Rutherford area of Napa Valley, 14.1% ABV, $14-18. Tom told us his favorite Sauvignon Blancs are from the Loire in France (big and acidic), followed closely by the Marlborough region of New Zealand (lemongrass). However, he loves this particular California Sauvignon Blanc, and considers it nearly Loire-like in style. The Rutherford area is known as Cabernet Country, and the “Rutherford dust” often imparts dusty, earthy characteristics to the aromas of wines produced there. Winemaker is Tom Rinaldi, formerly with Duckhorn; the wine was 10% barrel aged with lees for texture and the most subtle breath of oak, and 90% in steel. This wine was almost water-clear and colorless on the pour, with, remarkably, no condensation despite its cold temperature. Despite its brilliantly light color, it was alive with a saline grapefruit nose and a slight frizzante texture. Clean, tangy, and refreshing, this beautiful wine was loaded with tropical fruit, honey, and even a fleeting whiff of Play-Doh! Delightful. Screwcap closure. Obviously they are on target (ba-a-a-ad) with their winemaking program. Tom gave us a brief education as to some of the differences between Burgundy and Bordeaux. First, the Bordeaux region is generally much more grand, with wines often originating from Châteaux, while Burgundy wines generally originate from more rustic Domaines. Showing us the label on this wine, he pointed out the relatively modest (although lovely) structure depicted in the engraving on the label. 2. Also, because of the strict equal-inheritance rules, as time and people pass, each estate is divided equally into progressively smaller lots until an individual winemaker might be harvesting a row or two of vines and making maybe 25 cases. Furthermore, selling the land is next to impossible, even if it is next to heavenly. This sort of rarity and difficulty of getting into the distribution funnel is one reason good and rare Domaine-produced French wines tend to be expensive, if you can find them at all. 3. In Burgundy, wines are named first after the village, and then sometimes the specific vineyards, and third sometimes classified vineyards (i.e. Premier Cru, and at the top of the list Grand Cru [hilltop, “by far the most expensive.”]). So, is this “Puligny-Montrachet” THE exalted Montrachet? No, it is more or less a “village wine.” In 1879 the Puligny village, in the Côte du Beaune region, was allowed to add its most famous vineyard, Le Montrachet, to its name, and has basked in the sunshine of the rock-star-winemaker association ever since. Still, this is a great wine. Tom says, “It’s food-friendly, tight, and more acidic than big California Chardonnays.” In fact, it reminded us of California’s Chalone Chardonnay, which won accolades in the famous 1976 “Judgment of Paris.” (For more information on the little 1976 French tasting that changed history, click here.) The Chalone Chard is quite white-Burgundy in style, and remarkably inexpensive ($10-12/bottle); thus, a glowing review is coming soon. This is a red originating from the Côte de Nuits region of Burgundy. Like the previous wine, the hyphenated appellation means Chambertin is the most famous vineyard within the area, and the village of Gevrey incorporated its name into its own (1847). This one, 100% Pinot Noir, had a lush nose and taste that was much drier than the nose. (I find many French wines to be “serious,” i.e. very dry, in this way.) Nose: pipe tobacco, cherry, raspberries, strawberries, spice, oak, a hint of citrus. For more information on the history of Burgundy including a free downloadable mini-book, click here. WINE FOUR. Rosenblum Cellars, 2008 Zinfandel, Sonoma Valley, Monte Rosso vineyard, $32-42. Rosenblum Cellars was founded in 1978. Kent Rosenblum (pictured @left in the ’80s) is known as “The King of Zin,” and after tasting this whopper, we think this particular emperor definitely has on some very nice clothes. John Kane is winemaker today. One cool thing is that Rosenblum often credits the growers by putting their names on the labels, as in this one (Monte Rosso). This wine is a 3% field blend, explaining some of the complexity, but I’m not sure where all the gentle and chewy sweetness comes from! Anyhow, this vineyard is high above the fog at 1,200′ elevation, and it isn’t irrigated, with the goal of coaxing the fruits to grow concentrated flavors. Cherry, cranberry, vanilla, cedar, jam, fruity (old vine), lychee, a lot of vanilla (but no overbearing tannins). A sweet-ish, concentrated American red wine. WINE FIVE. Another Rutherford! 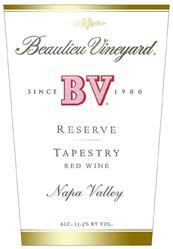 Beaulieu Vineyards, 2008 “Tapestry” Reserve, Rutherford area of Napa Valley, $38-48. A Bordeaux style blend of Cabernet Sauvignon, Merlot, Cabernet Franc, Malbec, and Petit Verdot. Oak, spice, dust, lots of structure, cherry later. BV1 and BV2 vineyards. The winemaker is doing barrel fermentation (super concentrated). BV went through a period of trying to appeal to the masses, but they’re obviously done with all that, as demonstrated by this very fine wine. I’m willing to pay more attention to BV from hereonout, and will report on it when I do. WINE SIX. Cheval des Andes, 2006 red blend, Mendoza, Argentina. 65% Cabernet Sauvignon, 35% Malbec, $49-75. Grown at a 3,000′ elevation, the grapes are subjected to very hot temperatures in the daytime and very cold temps at night, resulting in an intense wine made from grapes that must shiver and condense to maintain their life and integrity. Rustic and dusty, bone dry, grown in partnership with the French Château Cheval Blanc. Netting is spread over the vineyards, to protect the vines not from bugs or predators, but from hail from the nearby mountain range! Anyhow, this is our new friend Sommelier Tom Tiley’s tour of the world via six wines on a Saturday evening in November. We hope you enjoyed this as much as we did. 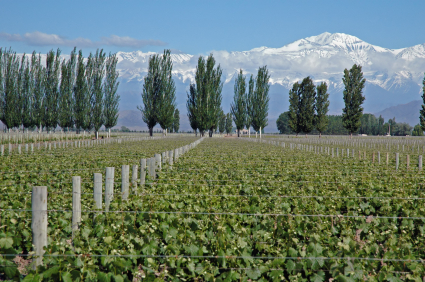 This entry was posted in Argentina, Cabernet Franc, Cabernet Sauvignon, California, Chardonnay, France, Malbec, Merlot, Petit Verdot, Pinot Noir, Red Blend, Restaurants, Sauvignon Blanc, Tastings, Zinfandel. Bookmark the permalink.